Tonight one of the photographers at the game Gail Kamenish captured this picture of Coach Mack. 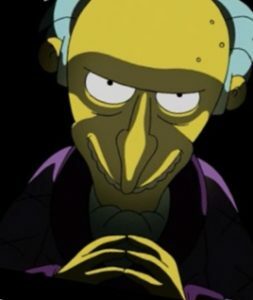 It reminded me of the Simpsons Characters Mr. Burns. One of Mr. Burns’ trademark expressions is the word “Excellent”, muttered slowly in a low, sinister voice while steepling his fingertips. And He occasionally orders Smithers to “release the hounds”. Tonight Coach Mack released the hounds on Southern as Louisville flexes their muscle in game #2 with a 104-54 win. Coach Mack also talks a lot about excellence. Tonight in his post game you can tell that he believes his team took another step towards that goal tonight. He still hasn’t smiled during a post-game but tonight he appeared satisfied. It’s getting to be the standard to talk about Jordan Nwora after these games. And tonight he stood out again coming off the bench scoring 20 points, grabbing 6 boards, with 2 steals and a blocked shot. There was one sequence in the game that stood out the most to me tonight. Jordan missed a three badly… Sprinted down the floor squared up on D, grabbed a defensive rebound and then led the break hitting CC for a three coming back up the floor. Good stuff! Following Nwora tonight in scoring and also having himself a game was Malik Williams with 17 points and 5 boards. Malik is one of the guys on this team whose upside is off the charts. He really is a ball of clay at this point just waiting for someone to mold into an NBA type player. 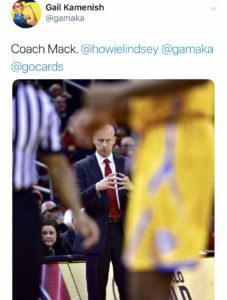 Coach Mack has a great reputation for player development, especially with Malik’s skill set. Mack knows how to use that versatility. Another guy with a high upside is Steven Enoch. This big fella has not missed a free throw yet. Going a perfect 9-9 in game one and 5-5 tonight. He is 14-14 on the season. I said it last week and will say it again this week. This guy is a great weapon to have. Honorable mention tonight goes to Akoy Agau. ‪(Old Faithful Akoy) The average interval between his games played in a Louisville uniform is 1439 days. It was good to see him back on the court. That guy has had some journey. It’s all about taking steps forward. Tonight Team 105 did that. L’s Up!